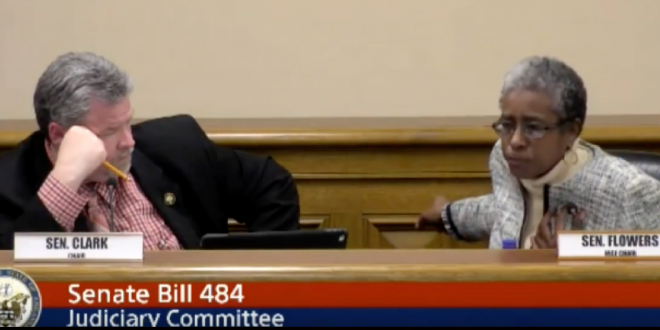 VIRAL VIDEO: Millions View Arkansas Democrat's Fiery Denouncement Of Proposed "Stand Your Ground" Bill - Joe.My.God. Millions of people in the last few days have viewed the NowThis News video of Sen. Stephanie Flowers, whose electric comments on race and guns during a committee meeting last week have drawn national attention. At least 5.3 million have viewed the video on Facebook and another 1.6 million on Twitter; I suspect that the count is significantly higher than that factoring in other versions and platforms. The “Stand Your Ground” proposal fell 5-3 in committee but is likely to be run again next week, potentially as soon as Monday. At one point, Arkansas Sen. Alan Clark, a Republican from Lonsdale, Ark., who must’ve never had a “What you aren’t going to do” experience in his life, learned Wednesday that what he’s not going to do is try and tell Sen. Flowers that she needs to stop.